Rev. Henry S. Hallman, "was born August 5th, 1859, in Wilmot Township, Waterloo County, Ontario. He attended the New Dundee public school until old enough to give an assisting hand on the farm. When well up in his "teens" he left the farm and worked with the carpenters and builders. Realizing the necessity of a better education, he entered the Berlin High School and other places of education until he passed his examination for the teaching profession. After teaching two and one-half years in Bruce County he retired from the profession and moved to Berlin where he still resides. When quite a young man he was converted unto the Lord and soon thereafter he joined with the River Brethren denomination, of which body he was a member for some years. In 1879 he united with the Mennonite Brethren in Christ denomination of which body he is an active member. In 1881 he gave his life to the ministry for the last named body and has served the church of his choice faithfully up to the present. 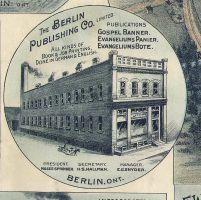 In October, 1888, the general conference held in Berlin, Ontario, had him appointed editor of the Gospel Banner, a position he still holds. He is united in wedlock with Maria Rosenberger and has a family of five children". In 1901 Henry had two orphan children living with him Naomi and Anna Fiddler. In the latter part of his life Hallman became active in the Christian and Missionary Alliance (CMA), although still retaining his membership in the United Missionary Church. For several years he was superintendent of the CMA publishing business in New York City, later serving as pastor of Alliance churches in Brantford and Toronto, ON. He died in Toronto on 13 October 1932. [S10] Book - Vol II A Biographical History of Waterloo Township and other townships of the county : being a history of the early settlers and their descendants, mostly all of Pennsylvania Dutch origin..., 195. [S3] Book - Vol I A Biographical History of Waterloo Township and other townships of the county : being a history of the early settlers and their descendants, mostly all of Pennsylvania Dutch origin..., 772. [S137] Census - ON, Waterloo, Berlin - 1901, Berlin (Town/Ville) A-7 Page 9. [S266] Funeral Card - - Funeral Card Notices of Waterloo County Volume 2. In/ Loving/ Memory.// Died/ In Toronto, Ontario, Thursday, October 13th/ 1932/ Rev. H. S. Hallman/ Aged 73 years, 2 months and 7 days// The Funeral/ was held on Saturday, October 15th,/ at 1.30 p.m./ at the Bethany Mennonite Church, Kitchener, Ontario./ Burial took place/ in the East End Mennonite Cemetery. [S140] Census - ON, Waterloo, Wilmot - 1881, Div. 3 Page 41. [S340] Census - ON, Waterloo, Berlin - 1911, Div. 26 Pg 8. [S190] Census - ON, Waterloo, Wilmot - 1871, Div. 1 Page 20. [S2264] Census - ON, Waterloo, Kitchener - 1921, Sub Dist. 30 Page 8. [S1592] Census - ON, Waterloo, Berlin - 1891, Sec. 5 Page 32.